Riding at normal speed you should release your front hand from the bar and start a slow back loop. Once the kite starts to pull you, kick a back roll with your free hand touching the water. As soon as your body is pointing upwind you should strech hard your bar hand to finish the kiteloop, that will give you the extra power you need to finish the movement. 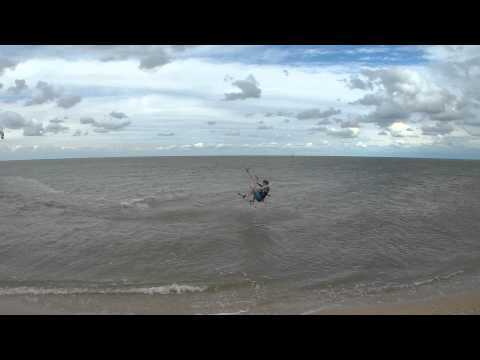 As soon as the kite exits the loop, you should point your back foot downwind so you can finish the transition.